Hesiod (/ˈhiːsiəd, ˈhɛsiəd/; Greek: Ἡσίοδος Hēsíodos) was a Greek poet generally thought by scholars to have been active between 750 and 650 BC, around the same time as Homer. He is generally regarded as the first written poet in the Western tradition to regard himself as an individual persona with an active role to play in his subject. Ancient authors credited Hesiod and Homer with establishing Greek religious customs. Modern scholars refer to him as a major source on Greek mythology, farming techniques, early economic thought (he is sometimes considered history's first economist), archaic Greek astronomy and ancient time-keeping. The dating of Hesiod's life is a contested issue in scholarly circles (see § Dating below). Epic narrative allowed poets like Homer no opportunity for personal revelations. However, Hesiod's extant work comprises several didactic poems in which he went out of his way to let his audience in on a few details of his life. There are three explicit references in Works and Days, as well as some passages in his Theogony that support inferences made by scholars. The former poem says that his father came from Cyme in Aeolis (on the coast of Asia Minor, a little south of the island Lesbos) and crossed the sea to settle at a hamlet, near Thespiae in Boeotia, named Ascra, "a cursed place, cruel in winter, hard in summer, never pleasant" (Works 640). Hesiod's patrimony there, a small piece of ground at the foot of Mount Helicon, occasioned lawsuits with his brother Perses, who seems, at first, to have cheated him of his rightful share thanks to corrupt authorities or "kings" but later became impoverished and ended up scrounging from the thrifty poet (Works 35, 396). Some scholars have seen Perses as a literary creation, a foil for the moralizing that Hesiod develops in Works and Days, but there are also arguments against that theory. For example, it is quite common for works of moral instruction to have an imaginative setting, as a means of getting the audience's attention,[nb 2] but it could be difficult to see how Hesiod could have travelled around the countryside entertaining people with a narrative about himself if the account was known to be fictitious. Gregory Nagy, on the other hand, sees both Pérsēs ("the destroyer" from πέρθω, pérthō) and Hēsíodos ("he who emits the voice" from ἵημι, híēmi and αὐδή, audḗ) as fictitious names for poetical personae. It might seem unusual that Hesiod's father migrated from Asia Minor westwards to mainland Greece, the opposite direction to most colonial movements at the time, and Hesiod himself gives no explanation for it. However around 750 BC or a little later, there was a migration of seagoing merchants from his original home in Cyme in Asia Minor to Cumae in Campania (a colony they shared with the Euboeans), and possibly his move west had something to do with that, since Euboea is not far from Boeotia, where he eventually established himself and his family. The family association with Aeolian Cyme might explain his familiarity with eastern myths, evident in his poems, though the Greek world might have already developed its own versions of them. In spite of Hesiod's complaints about poverty, life on his father's farm could not have been too uncomfortable if Works and Days is anything to judge by, since he describes the routines of prosperous yeomanry rather than peasants. His farmer employs a friend (Works and Days 370) as well as servants (502, 573, 597, 608, 766), an energetic and responsible ploughman of mature years (469 ff. ), a slave boy to cover the seed (441–6), a female servant to keep house (405, 602) and working teams of oxen and mules (405, 607f.). One modern scholar surmises that Hesiod may have learned about world geography, especially the catalogue of rivers in Theogony (337–45), listening to his father's accounts of his own sea voyages as a merchant. The father probably spoke in the Aeolian dialect of Cyme but Hesiod probably grew up speaking the local Boeotian, belonging to the same dialect group. However, while his poetry features some Aeolisms there are no words that are certainly Boeotian. His basic language was the main literary dialect of the time, Homer's Ionian. It is probable that Hesiod wrote his poems down, or dictated them, rather than passed them on orally, as rhapsodes did—otherwise the pronounced personality that now emerges from the poems would surely have been diluted through oral transmission from one rhapsode to another. Pausanias asserted that Boeotians showed him an old tablet made of lead on which the Works were engraved. If he did write or dictate, it was perhaps as an aid to memory or because he lacked confidence in his ability to produce poems extempore, as trained rhapsodes could do. It certainly wasn't in a quest for immortal fame since poets in his era had probably no such notions for themselves. 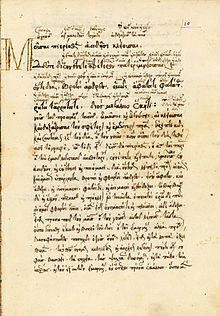 However, some scholars suspect the presence of large-scale changes in the text and attribute this to oral transmission. Possibly he composed his verses during idle times on the farm, in the spring before the May harvest or the dead of winter. The personality behind the poems is unsuited to the kind of "aristocratic withdrawal" typical of a rhapsode but is instead "argumentative, suspicious, ironically humorous, frugal, fond of proverbs, wary of women." He was in fact a misogynist of the same calibre as the later poet Semonides. He resembles Solon in his preoccupation with issues of good versus evil and "how a just and all-powerful god can allow the unjust to flourish in this life". He recalls Aristophanes in his rejection of the idealised hero of epic literature in favour of an idealised view of the farmer. Yet the fact that he could eulogise kings in Theogony (80 ff., 430, 434) and denounce them as corrupt in Works and Days suggests that he could resemble whichever audience he composed for. Two different—yet early—traditions record the site of Hesiod's grave. One, as early as Thucydides, reported in Plutarch, the Suda and John Tzetzes, states that the Delphic oracle warned Hesiod that he would die in Nemea, and so he fled to Locris, where he was killed at the local temple to Nemean Zeus, and buried there. This tradition follows a familiar ironic convention: the oracle that predicts accurately after all. The other tradition, first mentioned in an epigram by Chersias of Orchomenus written in the 7th century BC (within a century or so of Hesiod's death) claims that Hesiod lies buried at Orchomenus, a town in Boeotia. According to Aristotle's Constitution of Orchomenus, when the Thespians ravaged Ascra, the villagers sought refuge at Orchomenus, where, following the advice of an oracle, they collected the ashes of Hesiod and set them in a place of honour in their agora, next to the tomb of Minyas, their eponymous founder. Eventually they came to regard Hesiod too as their "hearth-founder" (οἰκιστής, oikistēs). Later writers attempted to harmonize these two accounts. Greeks in the late 5th and early 4th centuries BC considered their oldest poets to be Orpheus, Musaeus, Hesiod and Homer—in that order. Thereafter, Greek writers began to consider Homer earlier than Hesiod. Devotees of Orpheus and Musaeus were probably responsible for precedence being given to their two cult heroes and maybe the Homeridae were responsible in later antiquity for promoting Homer at Hesiod's expense. The first known writers to locate Homer earlier than Hesiod were Xenophanes and Heraclides Ponticus, though Aristarchus of Samothrace was the first actually to argue the case. Ephorus made Homer a younger cousin of Hesiod, the 5th century BC historian Herodotus (Histories II, 53) evidently considered them near-contemporaries, and the 4th century BC sophist Alcidamas in his work Mouseion even brought them together for an imagined poetic ágōn (ἄγών), which survives today as the Contest of Homer and Hesiod. Most scholars today agree with Homer's priority but there are good arguments on either side. An upper limit of 750 BC is indicated by a number of considerations, such as the probability that his work was written down, the fact that he mentions a sanctuary at Delphi that was of little national significance before c. 750 BC (Theogony 499), and that he lists rivers that flow into the Euxine, a region explored and developed by Greek colonists beginning in the 8th century BC. (Theogony 337–45). Hesiod mentions a poetry contest at Chalcis in Euboea where the sons of one Amphidamas awarded him a tripod (Works and Days 654–662). Plutarch identified this Amphidamas with the hero of the Lelantine War between Chalcis and Eretria and he concluded that the passage must be an interpolation into Hesiod's original work, assuming that the Lelantine War was too late for Hesiod. Modern scholars have accepted his identification of Amphidamas but disagreed with his conclusion. The date of the war is not known precisely but estimates placing it around 730–705 BC, fit the estimated chronology for Hesiod. In that case, the tripod that Hesiod won might have been awarded for his rendition of Theogony, a poem that seems to presuppose the kind of aristocratic audience he would have met at Chalcis. Three works have survived which are attributed to Hesiod by ancient commentators: Works and Days, Theogony, and Shield of Heracles. Other works attributed to him are only found now in fragments. The surviving works and fragments were all written in the conventional metre and language of epic. However, the Shield of Heracles is now known to be spurious and probably was written in the sixth century BC. Many ancient critics also rejected Theogony (e.g., Pausanias 9.31.3), even though Hesiod mentions himself by name in that poem. Theogony and Works and Days might be very different in subject matter, but they share a distinctive language, metre, and prosody that subtly distinguish them from Homer's work and from the Shield of Heracles (see Hesiod's Greek below). Moreover, they both refer to the same version of the Prometheus myth. Yet even these authentic poems may include interpolations. For example, the first ten verses of the Works and Days may have been borrowed from an Orphic hymn to Zeus (they were recognised as not the work of Hesiod by critics as ancient as Pausanias). ^ See discussion by M. L. West, Hesiod: Theogony, Oxford University Press (1966), p. 163 f., note 30, citing for example Pausanias IX, 30.3. Rhapsodes in post-Homeric times are often shown carrying either a laurel staff or a lyre but in Hesiod's earlier time, the staff seems to indicate that he was not a rhapsode, a professional minstrel. 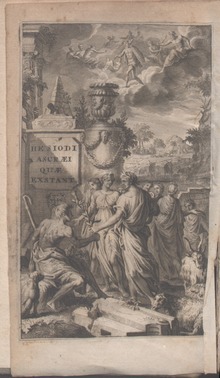 Meetings between poets and the Muses became part of poetic folklore: compare, for example, Archilochus' account of his meeting the Muses while leading home a cow, and the legend of Cædmon. ^ Jasper Griffin, 'Greek Myth and Hesiod' in The Oxford History of the Classical World, Oxford University Press (1986), cites for example the Book of Ecclesiastes, a Sumerian text in the form of a father's remonstrance with a prodigal son, and Egyptian wisdom texts spoken by viziers, etc. Hesiod was certainly open to oriental influences, as is clear in the myths presented by him in Theogony. ^ Gisela Richter, The Portraits of the Greeks. London: Phaidon (1965), I, p. 58 ff. ; commentators agreeing with Richter include Wolfram Prinz, "The Four Philosophers by Rubens and the Pseudo-Seneca in Seventeenth-Century Painting" in The Art Bulletin 55.3 (September 1973), pp. 410–428. "[…] one feels that it may just as well have been the Greek writer Hesiod […]" and Martin Robertson, in his review of G. Richter, The Portraits of the Greeks for The Burlington Magazine 108.756 (March 1966), pp. 148–150. "[…] with Miss Richter, I accept the identification as Hesiod." ^ Statistics for the three 'Hesiodic' poems taken from A. V. Paues, De Digammo Hesiodeo Quaestiones (Stockholm 1897), and stats for Homer from Hartel, Sitzungs-Bericht der Wiener Akademie 78 (1874), both cited by M. L. West, Hesiod: Theogony, p. 99. ^ The count of un-Homeric words is by H.K. 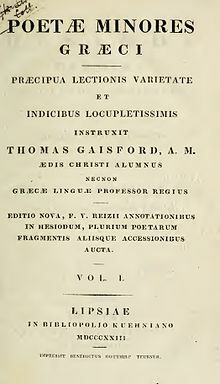 Fietkau, De carminum hesiodeorum atque hymnorum quattuor magnorum vocabulis non homericis (Königsberg, 1866), cited by M. L. West, Hesiod: Theogony, p. 77. ^ "Hesiod". Random House Webster's Unabridged Dictionary. ^ M. L. West, Hesiod: Theogony, Oxford University Press (1966), p. 40. ^ Barron, J. P., and Easterling, P. E., "Hesiod" in The Cambridge History of Classical Literature: Greek Literature, P. E. Easterling and B. Knox (eds), Cambridge University Press (1985), p. 92. ^ Andrewes, Antony, Greek Society, Pelican Books (1971), p. 254 f.
^ Rothbard, Murray N., Economic Thought Before Adam Smith: Austrian Perspective on the History of Economic Thought, vol. 1, Cheltenham, UK: Edward Elgar Publishing (1995), p. 8; Gordan, Barry J., Economic analysis before Adam Smith: Hesiod to Lessius (1975), p. 3; Brockway, George P., The End of Economic Man: An Introduction to Humanistic Economics, fourth edition (2001), p. 128. ^ Jasper Griffin, 'Greek Myth and Hesiod' in The Oxford History of the Classical World, J. Boardman, J. Griffin and O. Murray (eds), Oxford University Press (1986), pp. 88, 95. ^ Hugh G. Evelyn-White, Hesiod, The Homeric Hymns and Homerica (= Loeb Classical Library, vol. 57), Harvard University Press (1964), p. xiv f.
^ Griffin, 'Greek Myth and Hesiod' in The Oxford History of the Classical World, p. 95. ^ Gregory Nagy, Greek Mythology and Poetics, Cornell (1990), pp. 36–82. ^ Barron and Easterling, 'Hesiod' in The Cambridge History of Classical Literature: Greek Literature, p. 93. ^ a b c A. R. Burn, The Pelican History of Greece, Penguin (1966), p. 77. ^ Barron and Easterling, 'Hesiod' in The Cambridge History of Classical Literature: Greek Literature, p. 93 f.
^ West, Hesiod: Theogony, p. 41 f.
^ West, Hesiod: Theogony, p. 90 f.
^ Pausanias, Description of Greece, IX, 31.4. ^ West, Hesiod: Theogony, pp. 40 f., 47 f.
^ Griffin, 'Greek Myth and Hesiod' in The Oxford History of the Classical World, p. 88. ^ Barron and Easterling, 'Hesiod' in The Cambridge History of Classical Literature: Greek Literature, p. 99. ^ Andrewes, Greek Society, pp. 218 f., 262. ^ West, Hesiod: Theogony, p. 44. ^ Translated in Evelyn-White, Hesiod, The Homeric Hymns and Homerica, pp. 565–597. ^ West, Hesiod: Theogony, pp. 40, 47. ^ West, Hesiod: Theogony, p. 40 ff. ^ West, Hesiod: Theogony, p. 43 ff. ^ Barron and Easterling, Hesiod in The Cambridge History of Classical Literature: Greek Literature, p. 94. ^ Vernant, J., Myth and Society in Ancient Greece, tr. J. Lloyd (1980), p. 184 f.
^ J. A. Symonds, Studies of the Greek Poets, p. 167. ^ Paul Cartledge, Sparta and Lakonia – A regional history 1300 to 362 BC. 2nd Edition. ^ Symonds, Studies of the Greek Poets, p. 166. ^ W. Allen, Tragedy and the Early Greek Philosophical Tradition, p. 72. ^ Andrewes, Greek Society, p. 218. ^ Burn, The Pelican History of Greece, p. 78. ^ M. L. West, "Hesiod" in Oxford Classical Dictionary, S. Hornblower & A. Spawforth (eds), third revised edition, Oxford (1996), p. 521. ^ Works and Days 300: "Both gods and men are angry with a man who lives idle, for in nature he is like the stingless drones who waste the labor of the bees, eating without working." ^ Williams, Howard, The Ethics of Diet – A Catena (1883). ^ Most (2006, p. xi). ^ Suda, s.v. Ἡσίοδος (η 583). ^ Alcaeus fr. 347 Loeb, cited by D. Cambell, Greek Lyric Poetry: a selection of early Greek lyric, elegiac and iambic poetry, Bristol Classical Press (1982), p. 301. ^ Erika Simon (1975). Pergamon und Hesiod (in German). Mainz am Rhein: Philipp von Zabern. OCLC 2326703. ^ Griffin, Greek Myth and Hesiod, p. 88, quoting M. L. West. ^ West, Hesiod: Theogony, pp. 91, 99. ^ West, Hesiod: Theogony, p. 78. Cingano, E. (2009), "The Hesiodic Corpus", in Montanari, Rengakos & Tsagalis (2009) (eds. ), Brill's Companion to Hesiod, pp. 91–130 CS1 maint: Uses editors parameter (link). Athanassakis, A.N. (1992). "Cattle and Honour in Homer and Hesiod". Ramus. 21 (2): 156–186. Athanassakis, A.N. (1992). "Introduction to 'Essays on Hesiod I'". Ramus. 21 (1): 1–10. Athanassakis, A.N. (1992). "Introduction to 'Essays on Hesiod II'". Ramus. 21 (2): 117–118. Burn, Andrew Robert (1937). The World of Hesiod: A Study of the Greek Middle Ages, c. 900–700 BC. New York: Dutton. Clay, Diskin (1992). "The World of Hesiod". Ramus. 21 (2): 131–155. Debiasi, Andrea (2008). Esiodo e l'occidente (in Italian). Roma: L'Erma di Bretschneider. ISBN 978-88-8265-487-0. DuBois, Page (1992). "Eros and the Woman". Ramus. 21 (1): 97–116. Gagarin, Michael (1992). "The Poetry of Justice: Hesiod and the Origins of Greek Law". Ramus. 21 (1): 61–78. Janko, Richard (2007). Homer, Hesiod and the Hymns : diachronic development in epic diction. Cambridge: Cambridge University Press. ISBN 978-0-521-03565-1. Kirby, John T. (1992). "Rhetoric and Poetics in Hesiod". Ramus. 21 (1): 34–60. Kõiv, Mait (2011). "A Note on the Dating of Hesiod". The Classical Quarterly. 61 (2): 355–377. doi:10.1017/s0009838811000127. Lucas, Frank Laurence (1934). "Two Poets of the Peasantry". Studies French and English. London: Cassell & Co. pp. 23–75. Martin, Richard P. (1992). "Hesiod's metanastic poetics". Ramus. 21 (1): 11–33. Nagler, Michael N. (1992). "Discourse and Conflict in Hesiod: Eris and the Erides". Ramus. 21 (1): 79–96. Nagy, Gregory (1992). "Authorisation and Authorship in the Hesiodic Theogony". Ramus. 21 (2): 119–130. Thalmann, William G. (1984). Conventions of form and thought in early Greek epic poetry. Baltimore: Johns Hopkins University Press. ISBN 978-0-8018-3195-9. Walcot, P. (1966). Hesiod and the Near East. Cardiff: Wales University Press. West, M.L. (1985). The Hesiodic Catalogue of Women: its nature, structure, and origins. Oxford: Clarendon. ISBN 978-0-19-814034-4. Zeitlin, Froma (1996). 'Signifying difference: the case of Hesiod's Pandora', in Froma Zeitlin, Playing the Other: Gender and Society in Classical Greek Literature. Chicago: University of Chicago Press. pp. 53-86. Most, G.W. (2006), Hesiod: Theogony, Works and Days, Testimonia, Loeb Classical Library, no. 57, Cambridge, MA, ISBN 978-0-674-99622-9 . Most, G.W. (2007), Hesiod: The Shield, Catalogue, Other Fragments, Loeb Classical Library, no. 503, Cambridge, MA, ISBN 978-0-674-99623-6 .